Length: Round trip including the Rocky Point Loop is approximately 3.25 miles. Elevation Gain: 650 feet to the 4,290′ summit. When to Hike: March though November. Essentially, a year-round trail except during the snowiest times of the year. 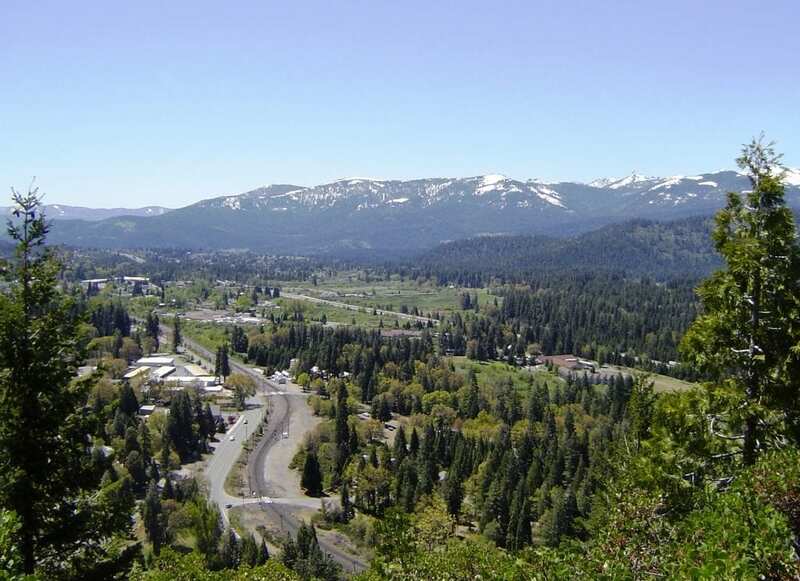 Special Features: Benches and tables along the trail give you a chance to rest and enjoy great views of Mount Shasta, Black Butte and the Strawberry Valley. Direction to Trailhead: From the Central Mt. Shasta City exit from I-5, take Lake Street east to Mt. Shasta Blvd (second traffic light). Turn left onto North Mt. Shasta Blvd and go north to Ski Village Drive. At Ski Village Drive turn right and then go straight to the trailhead beyond the first intersection. 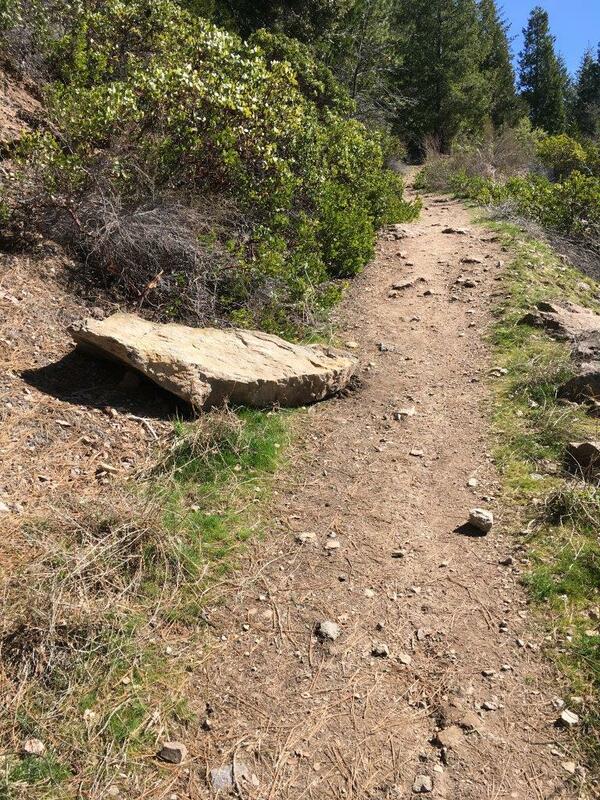 The trailhead is a loop with a sign on a large boulder announcing the trail. Description and Comments: From the parking area, there is a kiosk about 50 yards down the trail, where the trail turns moderately uphill. In about a third of a mile the single track trail hits an old road bed and follows the road to the summit of Spring Hill. Before the summit there are two junctions for Rocky Point, a loop trail that comes back to the road to the summit. The trail offers great views of Mt. Shasta, the city, and of Mt. Eddy. 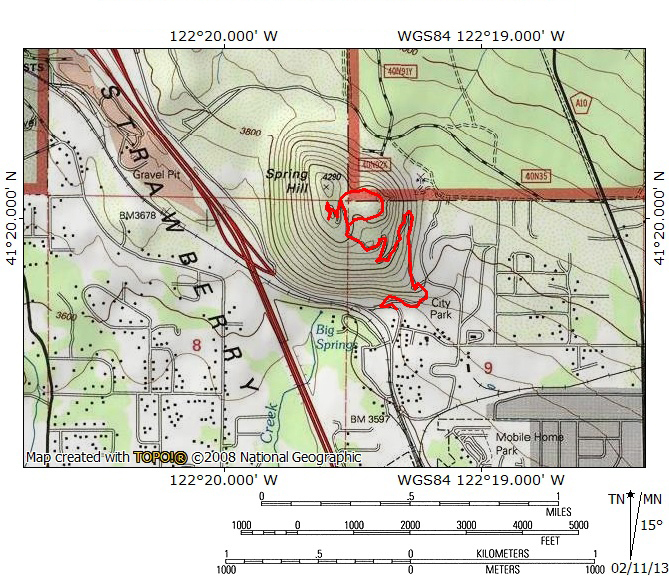 Geology: Spring Hill is considered a “parasitic” or “satellite” cone by geologists. Shaped by the accumulation of volcanic material not part of the central vent of Mount Shasta, the cone is formed by eruptions from unstable fractures on the flank of the volcano. Eventually the fractures reach the magma chamber and generate eruptions called flank eruptions which in turn produce a parasitic cone. How did Spring Hill get its name? Very close by is Big Springs, said to be the headwaters of the Sacramento River, across North Mt. Shasta Boulevard in the City Park. Icy clear water gushes from a lava tube originating deep within Mount Shasta. The water flows from here down through the Golden Gate to the Pacific Ocean — a 270+ mile trip. Spring Hill has also been referred to as Sisson’s Cone.